After the most romantic city in the world, Firenze, it was time to visit the next city on my route, a city with the oldest university in Europe and the birth place of the current education system, the beautiful Bologna. Thanks to Interrail I had a chance to take the famous Red Arrow high-speed train, which I could not enjoy more because it was a 35 minutes journey. 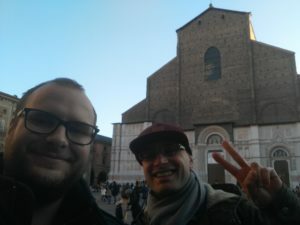 When I arrived in cold but sun-bathed Bologna, I met with the President of AEGEE-Bologna Kabir. 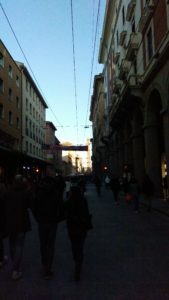 As the meeting with members was planned for the evening, he took me on a city tour and showed me part of the seven secrets of Bologna. If you want to find out what the secrets are, I am inviting you to apply to AEGEE-Bologna’s next events. Kabir explained to me that AEGEE-Bologna was re-established in 2012, signed the Convention d’Adhésion in 2013 and then they gather around 50 members yearly. Even as a student organisation, AEGEE-Bologna is still not recognised by the University of Bologna, due to the strict rules that organisation need to reach in order to get acknowledgement. The institution that is supporting the local is the municipality, which is offering them support for local activities and logistical support. The Antenna is also a member of one bigger umbrella organisation that is offering additional individual benefits on the base of the membership. 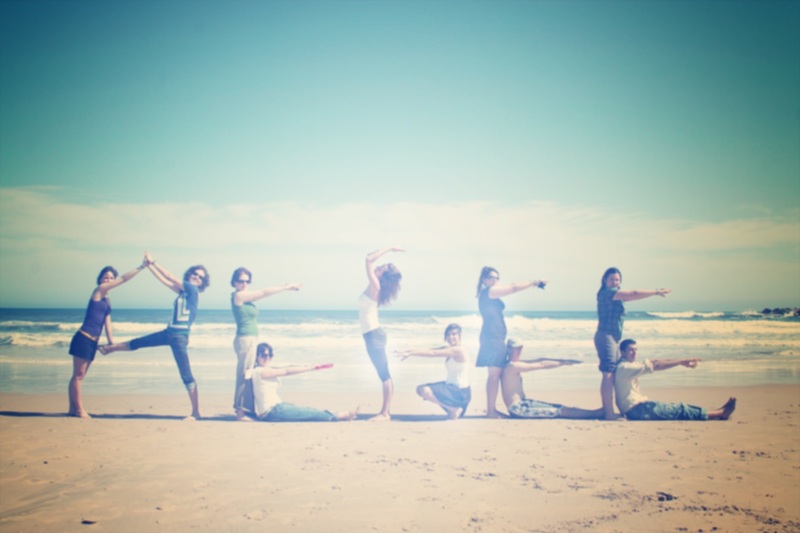 The strongest activity of AEGEE-Bologna is the University Tandem-Language Exchange. They are organising it very often and it is slowly turning into a trademark of the local. 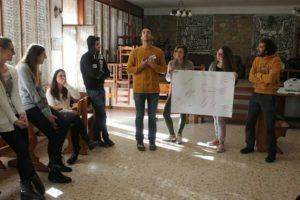 In cooperation with the municipality, AEGEE-Bologna will start to organise tandems from the other members of the community. Tandems will happen ten times and every time they will have a different topic to discuss in order to get people active and interested in the project. This year, the local is also organising a Summer University with four more Italian locals, which will give them a new experience. As for the problems that the local is facing, we discussed the lack of active members and some advice was shared with Kabir. So stay tuned, members of AEGEE-Bologna, as more activities are coming. We also discussed the monthly reports that need to be filled in for the Network Commission. The general opinion is that the form could be simpler, less demanding and that it would be good to receive some concrete feedback from the respective Netcommie. We concluded the day with the social programme with several members of AEGEE-Bologna. I am inviting you to check the interview with Kabir, and check what message he has for you, dear members. My next stop is AEGEE-Udine, so expect the article from there soon. Hosting an Agora is as much excitement as it is a challenge for any local. In an ideal case, it builds generations together, by offering the chance for a fresh new team to take over the management of the local, and to a team of more experienced members to organise one of the biggest statutory events in AEGEE history. Excitement and challenge it is, but AEGEE-Bergamo managed to face this challenge and has been growing stronger, combining both a strong local presence, Erasmus activities and trust of city officials, and also the opening of the local to hosting thematic projects, international context, a new twin antenna and lots of great ideas. 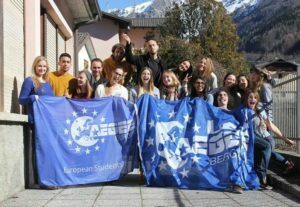 Even during the too short visit, there was a chance to get a glimpse into AEGEE-Bergamo’s work with Erasmus students during a getaway to the mountains, to remember the spirit of the Erasmus programme and the celebration of 30 years of Erasmus in 2017, and the group was great! In the following meetings with the board, we discussed the relations between the European level and the local level of AEGEE, and how to increase the number of active members in the local for the realisation of all the great ideas. Great ideas like a career fair, like the new project with high school students and like the Erasmus buddy system. With a new office, an old-new team of hard-working people and lots of great ideas – you will surely hear more from AEGEE-Bergamo, and you should not miss the chance to visit this wonderful city!